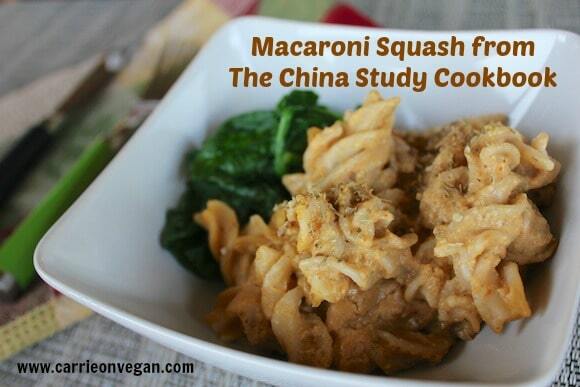 This vegan recipe comes from The China Study Cookbook. 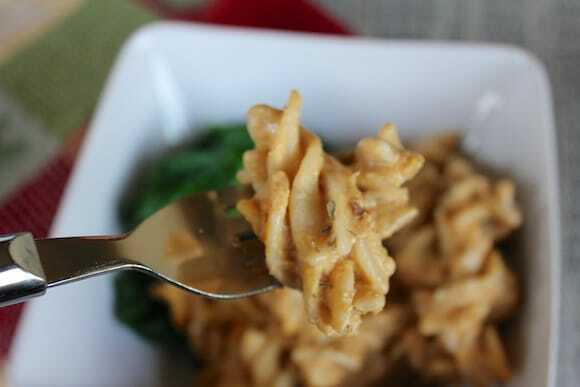 It’s a gluten-free pasta recipe made creamy using squash. Hi and happy Monday to ‘ya! I was sent a copy of The China Study Cookbook recently for a review. 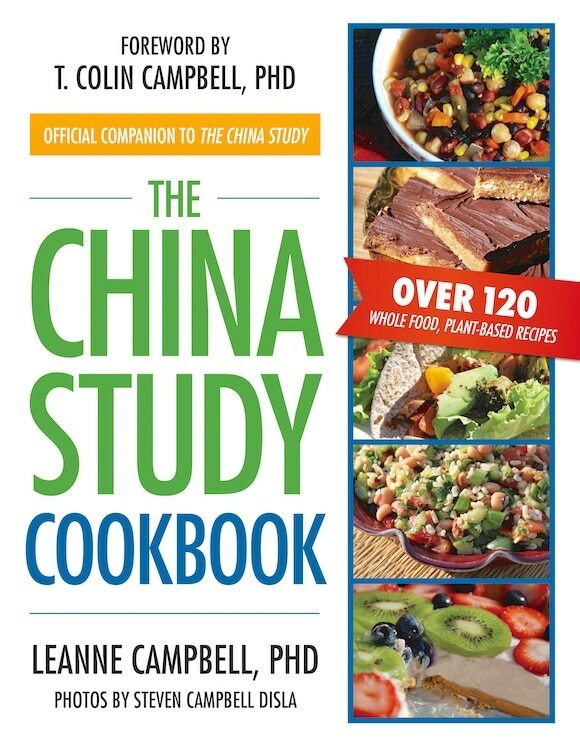 The book features over 120 healthy, plant-based recipes and was written by Leanne Campbell, Ph.D., who is the daughter of the China Study scientist, T. Colin Campbell, Ph.D. This cookbook sounded right up my alley, so I was thrilled to receive a copy and check out some of the recipes. It starts with a nice introduction by the author who describes her journey to a plant-based diet including the influence of the work of her father and her experience as a member of the Peace Corps working in the Dominican Republic. She includes a Q&A section on how to raise plant-based kids and an overview of how to build a healthy lifestyle in the midst of busy, modern living. 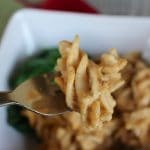 When selecting a recipe to share with you, my interest was peaked by the Macaroni Squash, especially because I had two pre-cooked sweet potatoes in the refrigerator just begging to be used. Place cooked macaroni in a large baking dish and set aside. Saute onion and garlic with 2 tablespoons vegetable broth in a large skillet over medium high heat. Add squash and cook until just heated through. Add to macaroni and mix well. Process cashews, milk, water, nutritional yeast, and miso in a food processor until smooth. Pour over macaroni mixture and mix well. Season with salt. Then cover with foil, and bake for 15 minutes. I was more than pleased with how well this dish turned out and I can’t wait to make more of the recipes including the Spicy Pumpkin Soup, Dominican Beans, and No-Bake Peanut Butter Bars. I love that all of the recipes have pictures, too, which I find to be an enticing feature of any cookbook. Awesome giveaway! Mmmm spicy pumpkin soup, you say? Sounds perfect for fall! Entered now we wait 🙂 very interested because I control my blood sugar by what I eat and I could sure use some help. This does sound like a good dish, I’m going to give it a try. Thanks for the review on the cook book too! I can’t do miso; does the recipe ‘need’ it? any substitute suggestions? I wondered whether perhaps pureed Swiss chard stalks (chard is comparatively high-salt for a veggie) might sub successfully. I’ve got a beautiful crop of chard in my autumn garden. Sounds like a great cookbook to try. Thank you! Please enter me in this giveaway, I would love to have this book. I love The China Study and look forward to this book too! My toddler loves anything pasta. I have been sneaking all beans/hummus as ‘cheese’ in them. I was thinking to add veggies paste. Your dish looks delish, will give it a try and if she eats butternut squash, It would be great 🙂 Thanks for the Cookbook review too! Interested to try it. that Is Funny!! I Was just Looking At A Recipe like This But It Had Pumpkin!! Ooooh, that does look yummy! I recently ordered this book and I agree that it has a lot of great pictures. I’ve yet to make any of the recipes, however – I need to get going on that! Let me know which recipes you try, Amy! 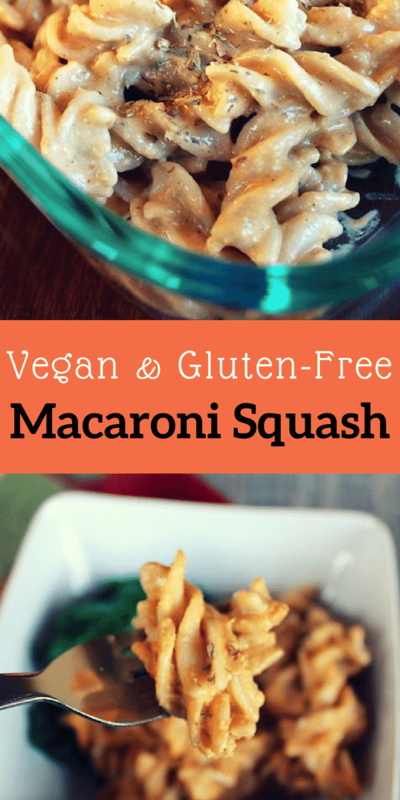 I have only made the Macaroni Squash but I like how there are so many easy ones like that Spicy Pumpkin Soup. Your site is just full of wonderful dishes. I do not know where to start. Though vegan if healthy, if I have to cook everything and eat them too, I will “bulge” . With all these recipes here, I am just so confused. Thanks. This book has the best recipe ever for mayonnaise. I think cashews are the secret ingredient. I also love the way she demonstrates how to cook for a family with older children. But seriously, check out the mayo!! but this recipe requires nuts to be heated to 350˚F. Did you cook cashew this way? Hi Michelle, the concern with cooking nuts at a high temperature is the formation of acrylamides. However, occasional intake isn’t that big of a deal, I have heard Dr. Fuhrman say that a few tablespoons of roasted nut butter is okay every week so this recipe would fall into that category of occasional intake. That is assuring! Thank you Carrie! Does the same thing apply to hemp seeds and flax seeds? I see a lot of baked goods recipes with ground flax seeds and hemp seeds in cupcake and pancake etc. But I was not sure about if it is healthy. Oh and when you are in NYC, you should dine at quitessence in East Village. It is organic raw vegan restaurant! They have fofu, which is their version of raw tofu. I see…you mentioned that there is even research supporting that. I researched etensively myself but could not find any research supporting the effect of heating flax seeds. Can you by any chance share the links? Have a safe trip! Excited to see travel posts on nyc where I reside! Hi Michelle! The research I read had to do with the health benefits of flax overall, not necessarily between unheated vs heated. I honestly have no idea where I saw the research, though, so I won’t be able to track it down for you. I’m going to have to check out this cookbook! I know I’m too late for the giveaway, but I love the China Study, love the Campbell family, and am so happy to hear about this cookbook! Thanks for sharing! 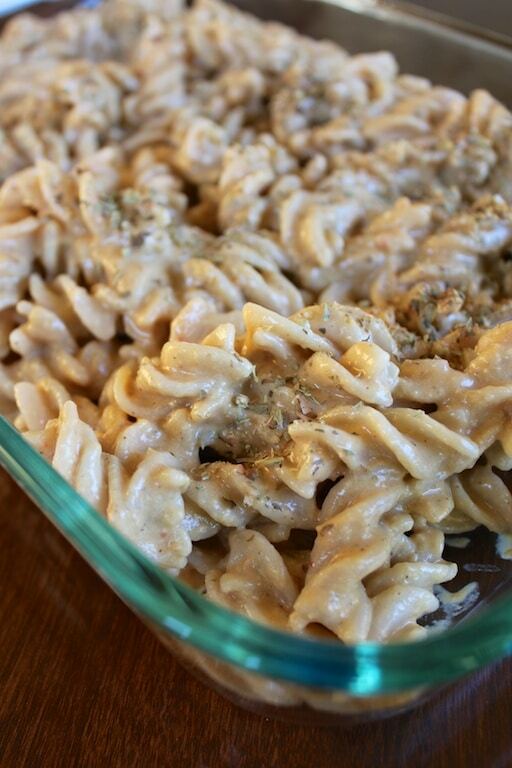 Love a creamy and gluten-free pasta dish like this!